Now, of course he is an academic, as this book amply demonstrates. But what I think he meant is that he’s also a cinephile, and everything he does in relation to cinema comes out of that. This includes his academic activity as a writer and a teacher, but also his writing outside a strictly academic context, his work as an editor of Senses of Cinema, and his involvement with the Melbourne Cinémathèque. For me personally, it wouldn’t be going too far to say that the Melbourne Cinémathèque. is Melbourne film culture, or Melbourne cinephile culture: at a time when many local film societies have disbanded or been forced to reinvent themselves, the Cinémathèque seems to go from strength to strength. That testifies to the relationship of trust and loyalty built up with its members through its commitment to a specific ethos – and Adrian is one of the main people responsible for shaping that ethos across the last couple of decades. Among other things, this means setting films in a critical context through the Annotations on Film published alongside the screenings, which is something Adrian has had a lot to do with. I would add that anybody who’s talked to Adrian about cinema will be aware that he has strong likes and equally strong dislikes, and is prepared to express these in a way that not all film academics will do in public. Again, this is reflected in something I’ve valued for many years about the Cinémathèque, which is that it’s a broad church but not an infinitely broad church. As an organisation, it’s unapologetic about the idea that some films are more important than others – about the idea of maintaining a canon. To be sure, this is a very open-ended canon that can incorporate B-movies by Roger Corman, and experimental cinema, and little-known Australian independent films. But I’m fairly confident you’re not going to see a retrospective on Michael Bay or Baz Luhrmann at the Cinémathèque any time soon. To my mind, Adrian’s approach in editing this book reflects all of these qualities: a commitment to critical discussion, an open-minded curiosity about film, and a willingness to draw lines. So on the one hand this is a book that looks beyond the well-known Altman films like Nashville (1975) and McCabe and Mrs Miller (1971). 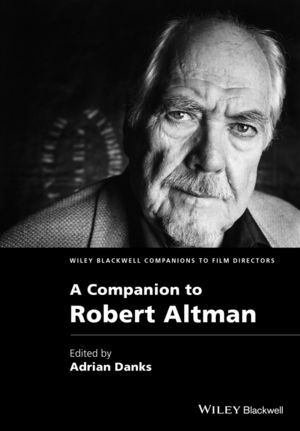 There are chapters on Altman’s extensive work for TV in the 1960s, and there’s an especially fascinating piece by Mark Minett on the industrial films which Altman made at the very start of his career. But there’s also a point in Adrian’s introduction where he draws a line and gives his personal canon of what he thinks are the major Altman works: McCabe and Mrs Miller, The Long Goodbye (1973), Thieves Like Us (1974), California Split (1974), Nashville, 3 Women (1977), Secret Honor (1984), Tanner ’88 (1988), Vincent and Theo (1990), Kansas City (1996), Gosford Park (2001), and A Prairie Home Companion (2006). Probably we’d all have changes to suggest, but I think that’s a pretty good list, and certainly it does suggest the range of Altman’s achievements. I’m especially happy that Adrian includes Kansas City, which I consider one of the most underrated Altman films, and which Adrian writes about beautifully later in the book. At this point, it’s probably time I said a little more about Altman himself. It’s striking that both Adrian in his introduction and Christos Tsiolkas in his piece on Altman’s 1980s work talk about discovering Altman’s films as teenagers – Adrian actually says that MASH (1970) was the first film he saw on home video. In fact I suspect that Altman’s films have been a kind of gateway into art cinema for many cinephiles, across a couple of generations: in my case the first Altman film I remember seeing, when I was thirteen or fourteen, was The Player (1992), his Hollywood satire with Tim Robbins as an amoral studio executive. This was probably one of the most sophisticated films I’d encountered up to that point: I saw it at a mainstream multiplex in central Melbourne and a lot of the jokes about Hollywood studios and the star system went way over my head. But I did understand some essential aspects of what the film was doing. I understood that it was playing teasing, self-conscious games based on our expectations of a film, especially a Hollywood film. I also understood there was another much more enigmatic side to the narrative, centred on the character played by Greta Scacchi: a mystery woman who’s an artist who paints pictures but just for herself, who is Icelandic or maybe she isn’t, and who doesn’t go to the movies. This character is a maverick on a couple of levels, because she doesn’t fit a generic type: she’s not a femme fatale, but nor is she a symbol of purity or authenticity in contrast to the corrupt anti-hero. At one point she’s described as a “pragmatic anarchist” – which is a label that would probably fit Altman himself. So that was quite a good introduction to a couple of sides of Altman’s personality, what Stephen Teo in his piece on Altman’s Westerns calls the yin and the yang. On the one hand there’s this snarky, often mean-spirited humour, pushed to the extreme in his 1985 teen film O.C. And Stiggs (which I’m actually quite fond of – I’m glad that Adrian gives it a qualified defence even though he thinks it marks a low point in Altman’s career). And then on the other hand there’s this dreamy, drifting, ethereal quality which is often, but not always, associated with female characters, and which you probably see in its purest form in a film like Images (1972), again not generally considered one of Altman’s greatest successes. Most commonly though, those two, seemingly opposed tendencies are somehow fused together. Watching The Player in my early teens I could sense all that, even though it was a film I didn’t entirely understand. Frankly there are things in Altman’s films I still don’t entirely understand, which is part of what keeps me going back to them. These are films that seem deliberately designed to slip out of your grasp: in the 1970s work especially, the soft focus and the famous overlapping dialogue literally mean you have to strain to see and hear what’s going on. On the conceptual level they can be equally unclear: a film like Nashville is clearly meant to be a big statement about America, but what exactly is the big statement? The more you look, the murkier it seems. So I think that critics and scholars writing on Altman face a very particular challenge: these are films that resist interpretation, resist being narrowed down to a single formula or a single set of meanings. And even if you’re working in a strictly academic context, you’re not going to get anywhere with his films unless you approach them with some imagination and willingness to go with the flow. There are many pieces in this book that have that kind of flexibility, but I just want to mention a couple of highlights apart from Adrian’s own writing. The first is Hamish Ford’s piece on “Visual Style in Altman’s 1970s Films”, a landmark essay which anybody writing on this topic from now on will have to come to grips with. This is a piece that contains a great deal of information about the nuts and bolts of Altman’s technique and also summarises much of the previous criticism and scholarship on this subject. But at the same time it’s grounded in the first-person experience of watching the films – so it’s not just about saying “Altman uses a lot of unmotivated zooms” it’s also asking “How does that relate to everything else happening in the film at the same time, and what total effect does that create?” What the piece turns out to be about finally is what Ford calls the “work on the materiality of the moving image” which he finds at the heart of Altman’s work in the 1970s, and how that departs from what we expect of both Hollywood cinema and art cinema. The other standout piece I wanted to mention is Murray Pomerance’s essay “High Hollywood in The Long Goodbye”, a film which for many people including both Adrian and myself ranks as one of Altman’s very best. This is an essay that defies summary, but it’s jam-packed with information about the production of the film and the geography of Los Angeles, as well as a lot of wonderfully evocative description of the setting and the main character, Raymond Chandler’s detective Philip Marlowe as played by Elliott Gould. The writing has a shaggy, digressive quality which fits very well with the film and with that character in particular. There’s a remarkable section near the end of the piece where Pomerance starts talking about the loneliness depicted in the film and how this reflects the real-life loneliness of people working in the film industry – the loneliness of being an actor, or a crew member, or a Hollywood agent. Pomerance talks about all this as if he knows it at first hand, which takes the piece a long way from a conventional scholarly essay. But then he says this: “What makes Hollywood especially interesting as a site of loneliness is its structural position between two great grinding forces: the hollow pressure exerted by the machinery of filmmaking; and the exhilarating, even utopian sociability portrayed on screen.” (247) That’s worth pausing on for a moment. On the one hand, the machinery of filmmaking – and I take it that Pomerance means the machinery of capitalism as well as literal machines. And then, on the other hand, utopian sociability, which is something that can often be located in the texture of Altman’s films, if not in the literal content. In a different way from Hamish Ford’s piece, that single sentence again brings us close to the heart of Altman’s cinema. But as I said before, you’re not going to do justice to Altman with any single critical insight or angle or formula. You need multiple angles, you need a polyphony of voices, which is what you get in Altman’s films, and is also what Adrian has orchestrated in this book. And just as I’ve kept on going back to the films, I expect to be returning to this Companion for many years to come. This was the XVIIth Film and History Association of Australia and New Zealand (FHAANZ) Conference, held at the Queensland University of Technology between Wednesday 1 July and Friday 3 July 2015. See https://www.ivvy.com/event/FHAANZ/. This is a slightly revised version of a speech delivered at the launch of A Companion To Robert Altman at RMIT University, September 8, 2015.